Integrated in the year 2007, at Mumbai (Maharashtra, India), we, “Parmar Steel”, are the reckoned manufacturer, wholesaler, trader, retailer and supplier of premium quality Industrial Fitting,Industrial Flanges,Automotive Pipes, Special Tubes,Round Bar, Non Ferrous Metal, Fasteners & Valves and many more products. The offered products is manufactured with the help of superlative quality material that is sourced from reliable vendors in the market and contemporary tools in compliance with set industrial norms. We offer these products in various customized options as per the specifications led down by them. These products are widely used in number of industrial and commercial applications. Further, these products are thoroughly tested on various stages by our quality analysts assuring their sturdiness and dimensional accuracy. Our offered products act as an external or internal ridge or rim for strengthening the attached objects. These products are highly demanded and appreciated by our clients for sturdy construction, dimensional accuracy, easy installation, anti corrosiveness, heat resistance, high strength, durability and compact size. In our endeavors to be one of the preferred names in our domain, we have armed ourselves with leading technology and modern machinery. Leveraging upon our modern infrastructural base, expertise of our in-house engineers and rich experience, we have established a broad and state-of-art infrastructure base that is designed with well-equipped instruments and technically advanced machines. Further, our warehouse is divided into various departments for handling several manufacturing processes such as procurement, production, quality control, warehousing & packaging, sales & marketing, etc. Work of all the departments is performed by our qualified and highly experienced professionals, who ensure flawless operation. Our manufacturing unit is assembled with the technically advanced machinery and the latest technology that assists us to undertake ample orders of clients and supply them products within the committed time frame. All our team members work round the clock in order to accomplish aims of the organization. Owing to perfection and quality oriented approach, we have set up a spacious warehouse that is facilitated with all the necessary machines and equipments that are necessary for storing our procured products in a safe and secure manner. The warehouse has been divided into different sections to store each and every product at their particular place. Also, our products are packed using high quality packing material to protect them from physical damage during transportation. Furthermore, to ensure that our clients get the best quality products, these are strictly tested on several quality parameters to ensure their heat resistivity and long functional life. Keeping this in mind the value of our customers, we have set our main aim to satisfy our clients by offering them superior quality products. Our team works in a well coordinated manner to ensure a smooth and flawless functioning, so that the products offered by us are exactly as per the requirement of our clients. While climbing on the success ladder, it has become increasingly important for us to deliver precisely tested and high grade products to our esteemed clients. We are successfully catering specific demands of clients under the guidance of our Proprietor “Mr. Naresh Mali”. His industry experience and sharp acumen has enabled us in expanding our business exponentially. Manufacturing and Trading of Automotive Pipes, Special Tubes, Industrial Fitting, Industrial Flanges, Round Bar, Non Ferrous Metal, Fasteners and Valves, etc. Consistent innovation, coupled with an alert understanding of customer's needs & demands, makes us the most renowned organization for offering premium quality material. We have with-us the most modern technology and latest machinery that help us to fulfill vast and urgent demand of our clients within scheduled time-frame. Our ware house is facilitated with all types of advanced equipment and sophisticated tools that allows us to successfully meet our production targets of different range of products. These facilities aid us to manufacture these products as per the set universal norms. We have constructed various divisions in this organization like production, quality control, designing, warehouse & packaging, etc. to manufacture and deliver the offered products in an organized and hassle free manner and also within the stipulated time frame. To see The attache File of our technical Data of Stainless Steel, Carbon steel and Alloy steel and non ferrous metals. 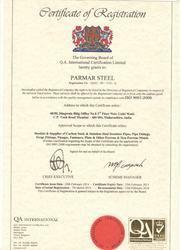 Parmar Steel success has been achieved through the adoption of a collaborative, open and ethical internal culture. The company has an experienced and skilled management team and workforce whose commitment is reflected in its excellent industrial relations record. Our well-motivated and enthusiastic management team has a culture to provide fully finished items on time–every time! We are Certified Stockist & Supplier of Carbon Steel, & Stainless Steel Seamless Pipes, Pipe Fittings, Forge Fittings, Flanges, Fasteners, Plate & Other Ferrous & Non - Ferrous Metals. 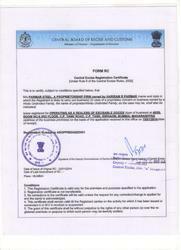 Central Excise Registration Certificate of Proprietorship. Owing to a modernized infrastructure for trouble-free processing & post-production, we have been able to establish ourselves as a prominent figure in this industry. Having a definite quality management system, and sincere efforts of our experienced professionals, we are successful in earning a good reputation in the sector of manufacturing and supplying the premium quality products. In addition to this, our workforce easily adapts to the latest changes taking place in the market in order to serve the clients in a better way.